Quantum technology is seen as an important future-oriented technology: smaller, faster and with higher performance than conventional electronics. However, exploiting quantum effects is difficult because nature's smallest building blocks have properties quite distinct from those we know from our everyday world. An international team of researchers has now succeeded in extracting a fault tolerant manipulation of quanta from an effect of classical mechanics. The motion of a tennis racket in the air can help predict the behavior of quanta. "Using an analogy from classical physics aids us in more efficiently designing and illustrating control elements for phenomena in the quantum world," reports Stefan Glaser, professor in the Department of Chemistry at the Technical University of Munich (TUM). "Controlling the properties of quanta and using them in technical processes has proven difficult thus far because the quanta adhere to their own laws, which often exceed our imagination," explains the scientist. "Possible applications such as secure networks, highly sensitive measuring equipment and ultrafast quantum computers are thus still in their infancy." "Utilizing quantum effects in a technical manner by influencing the behavior of particles through electromagnetic fields required the fastest possible methods to develop fault-tolerant control sequences," says Glaser. "To date, most of the methods build on very complicated computational processes." Together with an international team of physicists, chemists and mathematicians, the researcher has now discovered an unexpected, promising and novel approach: Using the tennis racket effect, a well-known phenomenon in classical mechanics, the consistent alteration in the spin of quanta via electromagnetic control commands can be visualized. The tennis racket effect describes what happens when one tosses a tennis racket into the air while imparting a rotation about an axis. When one spins the racket about its transverse axis a surprising effect appears: In addition to the intended 360-degree rotation about its transverse axis, the racket will almost always perform an unexpected 180-degree flip about its longitudinal axis. When the racket is caught, the initial bottom side will be facing up. "Responsible for this effect are tiny deviations and perturbations during the toss and the different moments of inertia along the three axes of an asymmetrical body. The effect can also be observed by tossing a book or cell phone into the air - for good measure over a soft bedding - instead of a tennis racket," elucidates Glaser. The longest and shortest axes are stable. However, the intermediate axis, in the case of a tennis racket, the transverse axis, is unstable and even miniscule agitations reliably trigger an additional 180-degree rotation. Quanta also possess angular momentum, known as spin. This can be influenced by applying an electromagnetic field. "The aim of this quantum technique is to change the orientation of the spin in a targeted manner, thereby minimizing errors caused by small perturbations," says Glaser. "The discovered mathematical analogy between the geometric properties of classical physics pertaining to freely rotating objects and controlling quantum phenomena can now be utilized to optimize the electromagnetic control of quantum states," summarizes co-author Prof. Dominique Sugny. As well as at the French University of Burgundy the scientists works as a Hans Fischer Fellow at the Institute for Advanced Study at TUM. 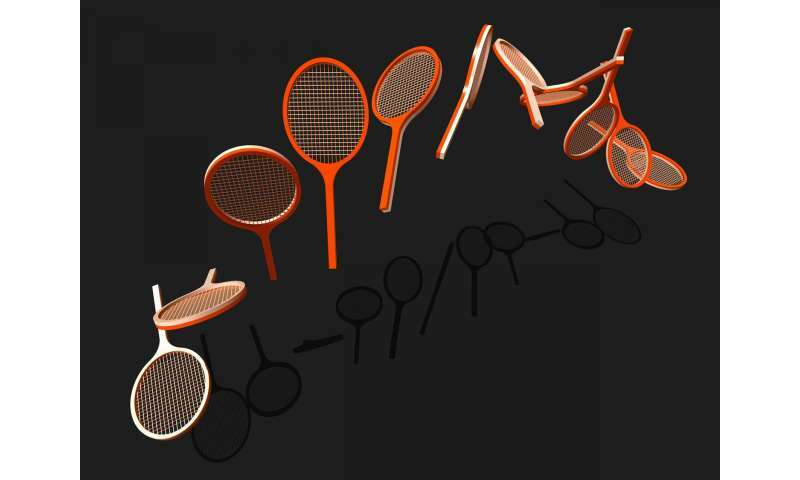 Using measurements of the nuclear spin, the team could demonstrate experimentally that the tennis racket effect really does improve the robustness of scattering sequences. They have now published their results in the journal "Scientific Reports." "Based on these research results, we can now develop more efficient mathematical models that allow errors to be avoided when controlling quantum processors," adds Glaser. "Building on the well-understood phenomenon from classical physics, we can not only visualize the development of reliable control sequences in quantum technology, but also accelerate them significantly."